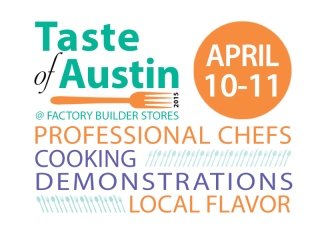 Factory Builder Stores is excited to host the 2nd annual Taste of Austin, a two-day, family-friendly event featuring foods native to the city of Austin. Each day experience a variety of culinary treats, live cooking demonstrations, hands-on opportunities and games with sweet prizes. Check out the full schedule of chefs and demonstrations on the Taste of Austin website.